Vasari included a life of Uccello in the Vite. He described him as a rather timid, solitary man, totally absorbed in his studies of perspective and “gifted with a sophisticated mind, he enjoyed investigating complex mechanisms and the strange products of the art of perspective”. According to Vasari, Uccello was highly regarded as an artist although “he passed his life in these extravagancies, ending up as poor as he was famous”. Vasari criticised the artist’s arbitrary use of colour for not conforming to reality but praised his talents as a landscape painter, noting that he was “the first of the older artists, among the modern painters, to be famous for his landscapes”. 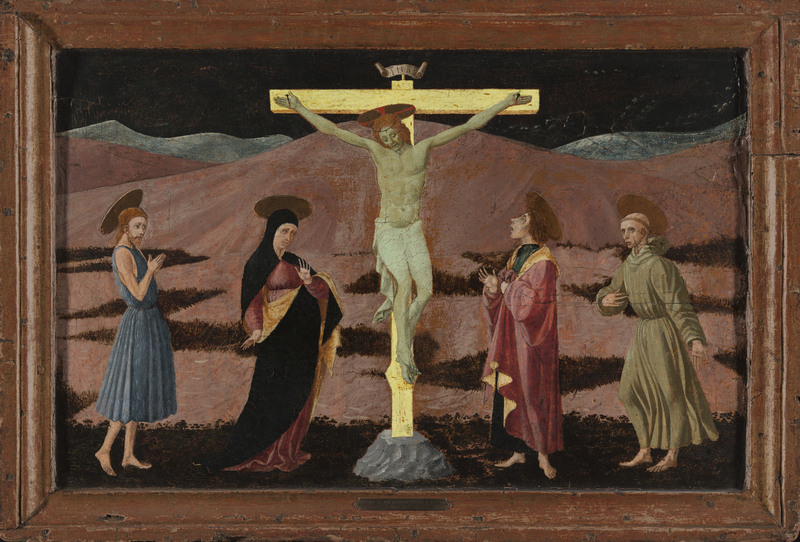 Due to its subject matter and format, The Crucifixion with the Virgin, Saint John the Baptist, Saint John the Evangelist and Saint Francis has been considered to be the central panel of a predella of which the other scenes remain unidentified, nor is it known for where it was painted or for which altarpiece. Uccello deployed a rigorous use of symmetry, to which both the landscape and other elements contribute. He organised the scene through the separate, isolated figures who establish no communication with each other apart from the shared, inner communication that each establishes with Christ. In the background the artist depicted an arid, natural setting against which the figures stand out through the rigorous lines that define their outlines and forms, set against the dense ochres of the background. In the foreground of the landscape Uccello placed clumps of dense vegetation, which create a pattern and which surround the rock on which the cross is set. The figures are of a type that the artist used in other compositions: they are thin and wear garments that fall in rhythmical, symmetrical folds (particularly Saint John the Baptist). They also have precise outlines, pointed noses and refined gestures. Since it was first published by Raimond van Marle as a work by Uccello the attribution has generally been accepted with only a few exceptions. The dating has been more open to debate, and the panel has been considered both a late and an early work by the artist. Boskovits, whose dating is the one now generally accepted, suggested that it was painted around 1460–65, and compared the style and technique with the predella from the oratory of the Annunziata in Avane, now on display in the Museo di San Marco, Florence.